I have the same type of scar. i thought TCA cross will help, maybe subsiccion. Good luck. 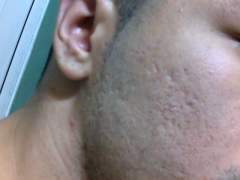 Your scars look like mine and only done one treatment of needling. I am in NNJ if you like to talk anyway..Where did you bought the dermaroller from? Did you start with a smaller needle say 0.5mm before jumping to 1.5mm? Why not the cream? i been using the cream and not a big difference yet. According to him, silicone can be used for ice pick scars as well Drewboy: Did you do self-needling? maybe u didnt get good results because of this. What are you thoughts on needling? I am glad everyone is having good results with Frank. Its been six months and i am ready for my second round. My scars have sunken a lot. Oh well. Panda Are you doing Fraxel all over your face or just the scarred area? Can you PM me about your results, the level setting,type of machine? at least we have something in common: skin type/color/cheek scars. Dee Check out my gallery pictures. I have two big scars and around them a lot of tiny ice pick scars, though they dont show at that angle. I did subsiccion and is not as invasive as what u got which is punch excission. My suggestion is that you can combine both procedures for better, faster results which personally i never done. It also takes couples of trials of subsiccion to see results but along with saline, it can work faster. Hi Chrissy I am glad you continue to have good results. I am wondering why doesnt he needlesthe three ice picks? Why would you go with a more invasive approach, excission? i dont get it. If you continue to see good results stick with what is working for you. Gals What % strength are u using? i started using retin micro 0.1% on my arms and it felt like i gotten a sunburnt. Dan Can we get subscission, TCA cross a few months later after silicone injections? Hi zaresa I thought needling was intended for rolling scars only. On another note, whats the difference between the HA Serum and HA powder besides the ease of application. I imagine getting the powder is like getting the pure form of HA. For some people maybe unnoticeable but for me whose constantly on meetings and briefing, i tend to be more critical. 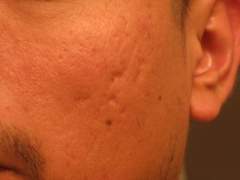 One derm said there is nothing to fix. Most derms i visited are not honest. I saw a plastic surgeon but i am not impressed by his skills. I am thinking of excision or saline injections or tca cross Any good docs in nj-nyc? Did you use any sunscreens? i read that AHA/BHA dont have any long term studies to determine if they are still safe.